Chiropractors are specially trained to locate abnormalities and quite successful in restoring proper spinal curves. You may not think about it as we do, but the natural curves that occur in the four different regions of your spinal column help to balance your body and prevent injury. The curve that should be present in the upper part of the spinal column, called the cervical spine, is a lordodic curve. When viewed from the side, this is a forward curve. 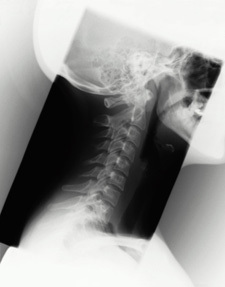 Injury or uncorrected trauma can cause the cervical spine to straighten and lose this vital lordodic curve. This is known as cervical kyphosis and can progress to the point where a reverse curve is formed. Even a slight reduction in the normal lordodic curvature can produce subtle or more obvious health problems. Symptoms can range in severity from mild discomfort and headaches, to decreased range of motion in the neck and in the most severe cases, paralysis. Neck pain may be common, but its not normal. If youre experiencing any type of neck pain, please call one our association members today to schedule a thorough examination. Chiropractors are specially trained to locate abnormalities in the spinal column and quite successful in restoring proper spinal curves. Wed love to help you or someone you know.